Rasetsu 1 | Manga Reviews ~ Ramblings of A Fob. Rasetsu, a sequel series of Yurara. I was hesitant to read this series since I ended up not liking Yurara. So anyway, I went ahead and read the first volume. It definitely shared the basic premise but here we have Rasetsu a young exorcist that resembles the maiden spirit in Yurara. She works at a company that provides exorcism services. Then Yakou entered the picture, just FYI Yakou was one of the main character in Yurara and he was in love with the maiden spirit. Well anyways.. This series is not for me, to be honest I found the plot quite ridiculous. So Rasetsu is a very beautiful heroine, she’s got brain and seems mature. Then some malevolent demonic ghost took possession of her body and if she turns 16 and still hasn’t found her “true love” the evil will take her soul. So yep that’s pretty much it. I find it hard to believed that all those years she hasn’t been able to get a guy, she’s freaking perfect. I also don’t like the episodic nature of this. I don’t know it never got me hooked even back in Yurara. The cases of exorcism were a little plain and dull. 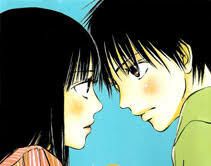 Although I did liked the first two volumes of Yurara but the episodic nature of both series weren’t spectacular. The art can be striking sometimes but there was something quite distracting, I think the body proportions and the hand. Sometimes the characters looked quite rough and weird. There are better series out there but who am I to stop readers, each to his own. I’ll pass this one.